The religion of this church is free, not creed-bound; scientific, not dogmatic; spiritual, not traditional; universal, not sectarian. It stands for the realization of the highest moral and humanitarian ideals of the world’s noblest teachers; and to the cultivation and dissemination of the spiritual qualities of reverence, peace and love as exemplified in the life of Jesus of Nazareth. In 1913 sixty-three people joined with twenty-eight charter members. Although today we are more religiously and spiritually diverse much of the bond of union of that time still are embraced today by the congregation. In 1953, with a surge in church growth because of the postwar boom, the buildings and parking at 9th and Lime became inadequate. Under Rev. 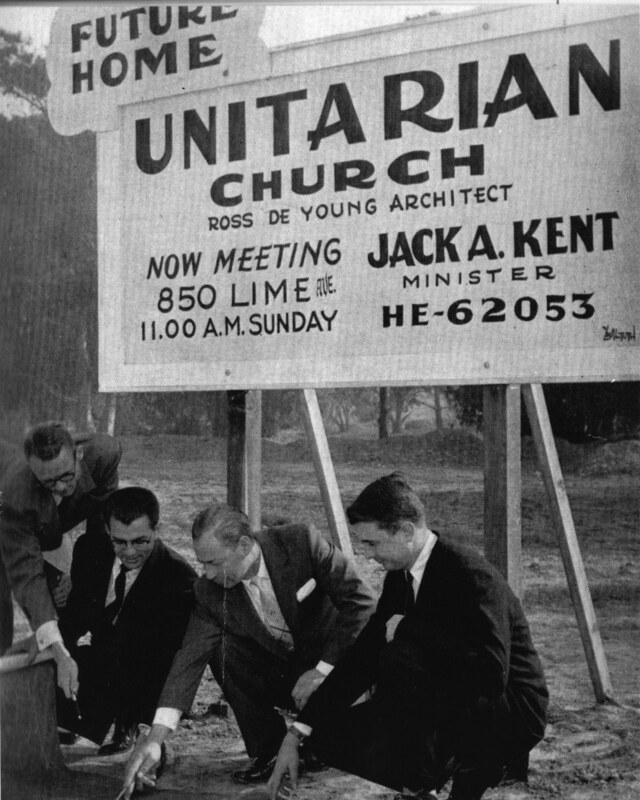 Jack Kent’s guidance, the congregation in 1955 voted to sell the property and to build a new church at 5450 Atherton. The Southern Baptists bought the original church property and the two congregations co-existed gingerly for two years. On September 8, 1957, the first services were held in the new building on Atherton, which had been painted and landscaped by members. The church school grew so fast in that period that the church soon had to have two services on Sunday mornings. During the Depression, Rev. Cora VanVelson Lambert, accepted the minister’s position when Rev. Byrnes died, stating that hers would be a caretaker ministry devoted to keeping the church open. She was an early female minister at a time when women were not welcomed in the pulpit, serving from 1933-1937. Continuing this trend of expecting leadership and ministry from women, the church recognized and ordained Junella Hanson, one of the first Ministers of Religious Education in the UUA. In the 1970s, this extraordinary religious educator created opportunities for study and experiences that excited and stimulated the congregation and fed a passion for curiosity and learning. With encouragement from Rev. Styzens, the members of the church chose to identify her as a minister. Thus, in 1974, Rev. Hanson was ordained by our church, exercising the right of congregational polity. Rev. Hanson went on to serve a celebrated ministry in subsequent churches and, in 1992, was awarded the Angus Maclean Award for outstanding contributions to religious education by the UUA. In the 1950s, while still at 9th and Lime, the church sponsored the first of two refugee families and after moving to our current location, the second, supporting them with housing, furnishings, and finding them jobs. They later became citizens. During the winter of 1984, our church offered sanctuary to two Central American families, turning one classroom into a combination living-bedroom and installing a shower in the women’s restroom, as well as giving the refugees the use of the kitchen. This was a daring act when few other UU congregations answered the call to house political refugees who feared life-threatening repression and persecution. The church has a long history of defending the oppressed through direct action and organizing… a history that is still being written today. By becoming a teaching congregation, our church sees itself as having a role in the future of the UUA. In 2005, ministerial Candidate Colin Bossen, under the supervision of Rev. Marguerite Lovett, became our first intern minister. Two years later, we were pleased to work with another intern, Denis Latournea Paul. The congregation saw itself as capable of providing an environment that could nurture and stimulate the leadership potential of an intern. The church was enriched by the experience and gained a deeper understanding of the nature of ministry. With two successful intern ministries to its credit, the congregation looks forward to continuing its role as a teaching congregation in our movement. For the Sunday Worship at the close of District Assembly (DA), UUCLB presents two worship services at 9am and 11am. The two services are separate and self-contained, but also fit together to form one long worship service with an “Intermission” in the middle. Both services are inspired by the DA theme “From the Ground Up.” Both services will include a little of everything, but the 9am service emphasizes “the Word” with poetry and preaching from our Interim Minister, Rev. Hoyt-McDaniels, while the 11am service emphasizes “Music” with congregational singing and music from combined choirs from Unitarian Universalist churches throughout the area under the direction of UUCLB Director of Music, Francisco Ruiz and DA Keynote, Donald Milton III. Reverend Rick Hoyt-McDaniels serves as our Interim Minister through June 2020, as we embark on our search for a new minister. Read more about the ministerial transition process here.